Uglyworld #2134 - Gianters Buddha - (Project Cinko Time - Image 333-365), a photo by www.bazpics.com on Flickr. I hopes you all has managereds ok withouts me for the lasts coupler of days while I hads no internets to shares my adventurers with you alls, believers me, the photomagraphs that I has to shares with you now is well worthers the wait! 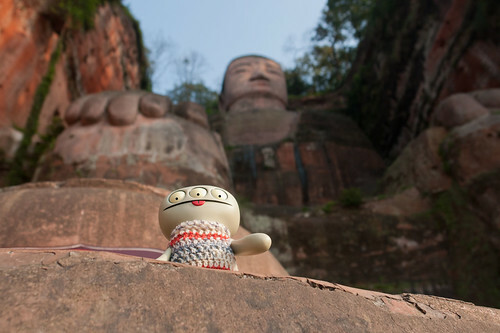 Earliers on Fridays morning we flyereds West to a city callereds Chengdu, and from there jumpereds on a bus to takers us to a place callereds Leshan which has this completelies massive gianters buddha carvereds into the rockfacer. He's so gianters that the rocks you can sees me standings in front of is justs one of his biggers toes, seriouslies!! !